"I installed it today and it's pretty trick. It calculates what gear you're in by comparing engine rpm to road speed which is the same way our bikes turn on the 6th gear light. Installation is simple. 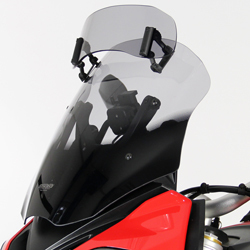 The unit comes with a long cable that plugs directly into the bike's diagnostic plug located under the left side cover. 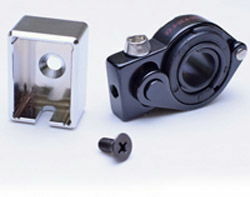 The unit itself measures 3/4" wide by 1 1/8" tall and 1/2" thick. They supply it with double sided tape on the back so you can stick it on. Its available with either a red or blue display. After installing it you have to teach it each gear and relative rpm. You can do it on a jack with the rear wheel off the ground or on the road as long as you have enough room to go through all the gears. When you turn the ignition on it flashes "L" for learn and then starts flashing "1". You ride a short distance in first and then it flashes "2" and you shift into second. You do the same for all 6 gears and its done. They even incorporated a simple way to clear the memory in case you need to reteach it. In neutral it shows a dash. It reacts to a gear change in less than a second. About the same amount of time it takes for the bike's 6th gear light to come on." 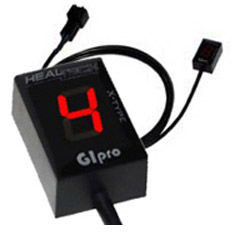 For all Harleys without electrically driven speedos as standard (but which do have an electrically/electronically driven Tacho/Rev-counter) the GiPro Wheel Speed Sensor (WSS-Type) comes with a magnetic pickup convertor included to provide the electrical pulse required to activate your gear indicator. Please note the WSS units are universal and not model specific, but installation has been made as simple as possible. !quote, electronics, naked, faired, dyna, softail, sportster, touring, 883, 1200, sportsters, xl50, 50th, xl883n, xl883r, iron, xl883l, 883l, xl1200c, 1200c, xl1200x, 1200x, custom, superlow, low, xl1200v, 1200v, 48, 72, forty, eight, seventy, two, forty-eight, seventy-two, xl1200t, 1200t, nightster, xl1200n, 1200n, roadster, low, xl1200l 1200l, anniversary, xl1200r, 1200r, xl1200s, 1200s, sport, hugger, xl, xl883l, xlh, xlh883, xlh1200, softail, tail, fls, slim, flstci, heritage, classic, flstfi, fatboy, fat, boy, flstfb lo, flstfse, screaming, eagle, flstni, deluxe, flstsi, classic, springer, flst, flsts, flstsb, flstf, cross, bones, crossbones, flstsci, fxcwc, rocker, blackline, line, breakout, out, fxsb, fxsti, standard, fsxtb, fsxtbi, nighttrain, train, fxstc, custom, fxstd, deuce, fxstsse2, fxstsse3, FXDWG, FXDB, fxdb, wide, glide, wideglide, street, bob, streetbob, FXDC, superglide, custom, FXDF, fatbob, bob, switchback, FLD, FXDL, lowrider, rider, custom, screaming, eagle, superglide, fxdli, fxdbi, fxdci, fxdwgi, fxdxi, fxdxt, convetible, sport, anniversary, 35th, t-sport, tourers, flhrc, road, king, roadking, street, glide, streetglide, roadglide, flhxse, flhtkse, flhri, flhtci, cvo, flhtkl, special, ultra, limited, flhtcul, flhtcui, flhrci, fllhri, classic, electra, special, low, flhtcutg, tri, freewheeler, wheeler, fltrx, fltru, king, screamin, screaming, eagles, standard, 90, 91, 92, 93, 94, 95, 96, 97, 98, ,99, 00, 01 ,02, 03, 04, 05, 06, 07, 08, 09, 10, 11, 12, 13, 14, 15, 16, 17, 18, 19, 20, 1990, 1991, 1992, 1993, 1994, 1995, 1996, 1997, 1998, 1999, 2000, 2001, 2002, 2003, 2004, 2005, 2006, 2007, 2008, 2009, 2010, 2011, 2012, 2013, 2014, 2015, 2016, 2017, 2018, 2019, 2020!